(Trent Nelson | The Salt Lake Tribune) Rep. Merrill Nelson, R-Grantsville, as the House debates and narrowly fails to pass HB197, which would have allowed the cultivation of marijuana. Salt Lake City, Friday February 9, 2018. 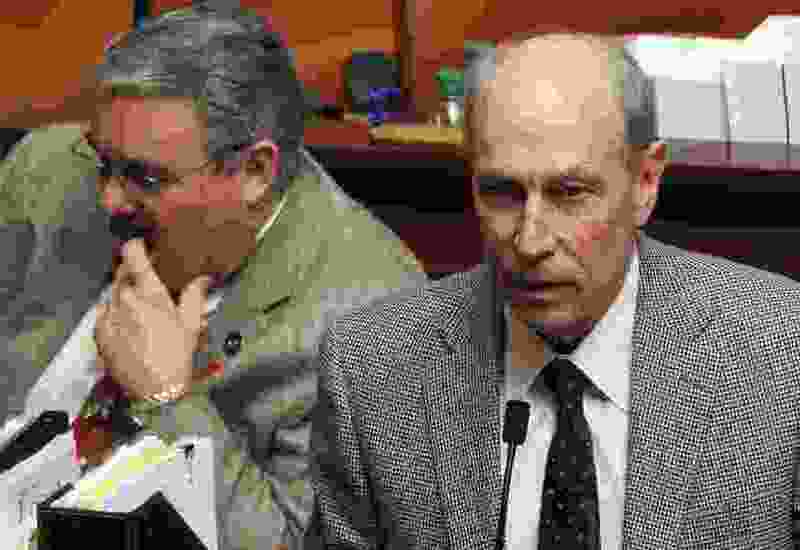 Despite warnings that it may unconstitutionally infringe on powers of the executive and judicial branches, the Utah House voted Wednesday to make it easier for the Legislature to intervene in court cases challenging the laws that it passes. Representatives voted 61-8 to pass SB171, and sent it to Gov. Gary Herbert for his consideration. Herbert said this week that he is considering vetoing such bills that may interfere with separation of powers between branches of government. It’s possible legislators could muster the two-thirds votes to override a veto given the wide margin of approval in the House and Senate. The bill grows out of efforts by part-time legislators to win more power against the full-time executive branch. That began when Herbert and Attorney General Sean Reyes angered legislators last summer by blocking their involvement in setting rules for a special congressional election. Herbert refused to call lawmakers into a special session to set rules for that election. Legislators then asked Reyes for a legal opinion about the governor’s authority to do that. After his office prepared the opinion, Reyes withheld it until months after the election because Herbert argued Reyes was essentially his attorney and releasing it would violate his attorney-client privilege. Rep. Merrill Nelson, R-Grantsville, House sponsor of SB171, acknowledged in debate Thursday that, had it been law last summer, “I suppose it would have provided us an opportunity to intervene with our own legal counsel.” But he said it also grows out of several other conflicts through the years. SB171 would give the Legislature “an unconditional right to intervene” in any lawsuits that challenge a state law, or any action of the Legislature. Nelson also predicted that the Legislature would only rarely use the new power. Rep. Lowry Snow, R-Santa Clara, another lawyer opposed the bill. “I think it would put potentially at odds the interest of the Legislature and the interest of the state of Utah,” he said. Legislative analysts figure the bill would cost an extra $700,000 a year to fund an estimated three new attorneys, a paralegal and a legal secretary for the Legislature to fulfill obligations of the bill. Budget writers included money to fund that in appropriations bills.